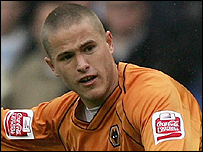 Wolves have calmed fears about winger Michael Kightly's future at the club by securing him on a new four-year deal. The 21-year-old joined on loan from Grays in November 2006 before earning a two-and-half-year deal in January 2007. His form helped the club into the Championship play-offs and saw Kightly linked with several clubs. "I have said from day one that I'm happy here and would sign a longer contract if I was offered one," Kightly told his club's website. "The discussions on personal terms went well and now I can look forward to another four good years here." Wolves lost to derby rivals West Brom in the semi-finals of the play-offs but Kightly has set his sights on helping the club into the Premier League after signing the improved deal. "The ambition is to kick on and get into the Premier League and I want to be part of it and play at the highest level," he added. Wolves are close to being taken over by businessman Steve Morgan and are hopeful of luring Southend striker Freddy Eastwood to the club to bolster their squad. And Kightly, who has backed the signing of 23-year-old Eastwood, now seems to be the blueprint for the type of player Wolves are trying to capture. The club's chief executive Jez Moxey said: "Michael has made a big impression on everyone since he joined us. "It was a big step up for him from non-league football and he has handled it superbly. "He has also been an exemplary professional and is a great personality around the club. "He has typified the sort of player we want here at Wolves - young, talented and a desire to work hard for the cause."